Every business involves people, and so every business needs a way to work with people more effectively. DISC personality assessment gives you that advantage, whether you're hiring or assessing, or need ways to help motivate people or improve relationships. DISC gives you an approach to people that's both systematic and reliable, helping you to understand personal drives and attitudes at a deep level. According to research, more than half of the world's organisations now use personality assessment as part of their recruitment process. DISC is one of the most popular of these assessment tools, providing a simple and efficient personality test coupled with dense and thorough reporting techniques. From the factors that it measures, DISC can build a detailed picture of a person's individual drives, helping to match an individual not only to a role, but also to the people around them. Based on the quick and simple DISC questionnaire, you can build up a detailed insight into any candidate's personality. From this you can extrapolate their likely performance in whole range of different roles and situations, and it's easy to see how this provides a real advantage in hiring and recruitment. Among the huge variety of personality elements explored by DISC lie such aspects as drive and determination, confidence and communication, empathy, reliability and organisation. It's easy to see how an insight into features like this can help you make strong and effective recruitment decisions. 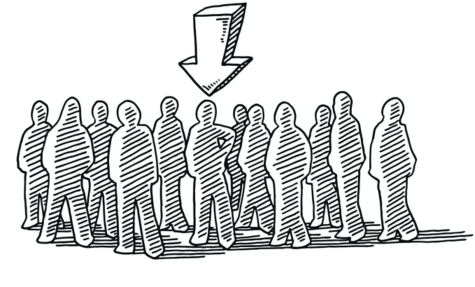 A DISC profile gives you powerful advantages in recruitment, but it can do much more beside. Understanding individual personality styles brings benefits in just about any business situation that involves dealing with people. Team building is an obvious example, and DISC assessment can be hugely useful in understanding the roles of individuals within a team. DISC also has a vital part to play in performance assessment and review, as well as fields as diverse as leadership, training, counselling, sales and support. In all these situations and more, DISC personal assessment can help you to get the most out of people. The process of applying DISC could hardly be easier. The are various different ways to administer a DISC test, but the most direct and straightforward is to handle the process online. With this kind of approach, all you need to do is provide a candidate's e-mail address; everything else can be handled automatically. The candidate is provided with an online questionnaire, which typically takes about ten minutes to complete. Once their answers have been collected, they can be collated and analysed for you, and a DISC personality report compiled right away. This approach gives you an immediate insight into a candidate's personality within moments of them completing their online DISC test. Once a candidate has completed a DISC profile, you have a huge amount of information at your fingertips. Making the most of this information is the domain of the DISC report, a structured exploration of an individual profile and its implications. The analyses within a report can vary from simple graphs showing DISC factor values to more sophisticated interpretations. The fullest DISC reports are built by expert systems with the ability to write detailed explanations in natural language, covering a whole range of business-oriented topics. Extended reporting can explore a profile in even more detail, providing extra reports covering specific needs. For example, a feedback report allows you to follow best practice by providing a candidate with their own results, but in a form designed specifically for this purpose. Other reports can cover specific job or role suitability, relationships with other people, team management and leadership, and much more besides. You don't need a detailed technical understanding of DISC to apply a questionnaire or create a report, but the more you understand about the theory behind it, the more you'll get out of a DISC analysis. At its most basic level, DISC measures four key personality factors and assesses their relative importance in a personality. These four factors are Dominance, Influence, Steadiness and Compliance (or D, I, S and C) and using these fundamental values as a starting point we can go on to investigate the workings of a personality in detail. If you want to explore DISC theory in more detail, you'll find plenty of reference material to help you. 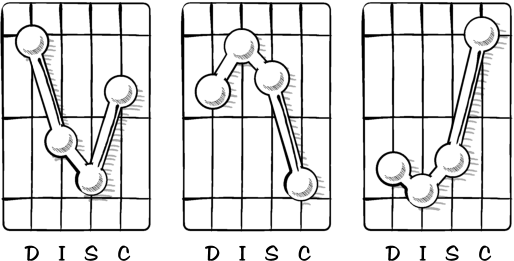 A great place to start on the basics is the Understanding DISC guide. If you'd like to review the statistical underpinnings of the approach in a more technical sense, you'll be interested in DISC Reliability and Validity. Quick and simple: A straightforward profile experience can create a personality assessment in a matter of minutes. Relevant and informative: Gain insights into a whole range personality factors with a direct impact on personal performance and integration. Matching people to roles: Help to find roles that fit a person's individual style exactly, or find people who match the personality needs of a role. Working together: DISC includes features that help you to assess individual working relationships, as well as within teams and groups. 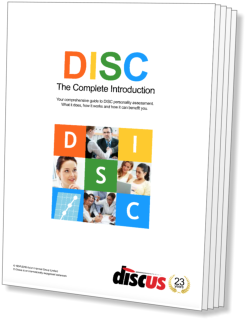 An industry-standard solution: DISC is used across the world, and is one of the most widely used personality assessment techniques, especially in a business context.